The Egadi rams are currently being scanned in a project conducted by Peter Campbell, PhD candidate at the University of Southampton, through a grant by the Honor Frost Foundation. The structured 3-D light scanner operates by projecting a narrow band of light onto ram’s surface, which produces a line of illumination, or a light section, that appears distorted from other perspectives than that of the projector, and can be used to exactly reconstruct the shape of the surface. Many light sections are projected simultaneously, and as such a multitude of samples are acquired at the same time. The displacement of the stripes allows for an exact retrieval of the three-dimensional coordinates of any details on the rams surface. 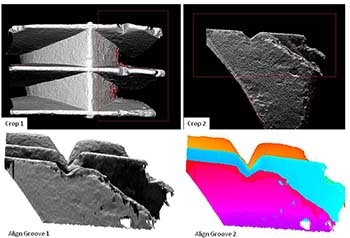 The 3D scans and metal compositional data will be used by Ship Science to make a finite element analysis, which identifies the stress load as it is spread over the surface of the ram. The scanner rapidly maps the three-dimensional features to sub-millimeter accuracy without any impact on the artifacts themselves. The scanner produces three-dimensional image that can be rotated and examined from any angle, can be measured to a fraction of a millimeter, revealing inscriptions or decorative details that are invisible to the naked eye. The next step will be to cast a 1/4 scale bronze replica and, using digital load cells and stress indicators, ram it into various hull reconstructions and other bronze pieces at a crash test facility. This data will be inserted into digital ship science models to see how water drag, etc, would influence the ram during ramming. All together this should provide functional data on the rams that will be compared to the anchor and hull conclusions in order to draw broad conclusions about technological innovation and change. 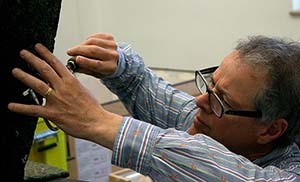 As part of the Ram Modeling Project initiated by Peter Campbell, and supported by a grant from the Honor Frost Foundation, a full metal analysis is being conducted by Dr. Ian Croudace. Dr. Croudace is a Professorial Research Fellow at the Ocean and Earth Science Department of the National Oceanography Centre Southampton. During the period of modeling analysis, samples were taken from each of the Egadi rams. These small samples will undergo metallurgical analysis to determine the different metals in the bronze casting and their percentage. Bronze is an alloy of Copper and Tin, with Copper usually accounting for 90% and Tin for 10%. Other trace elements are found in ancient bronze castings, and preliminary analyses indicate significant amounts of lead are present in some of the rams. The investigation will also include lead-isotope analysis in an effort to determine the origin of the lead. Samples were taken from different areas on each ram so that it will be possible to ascertain any differences within the metal due to the casting process. 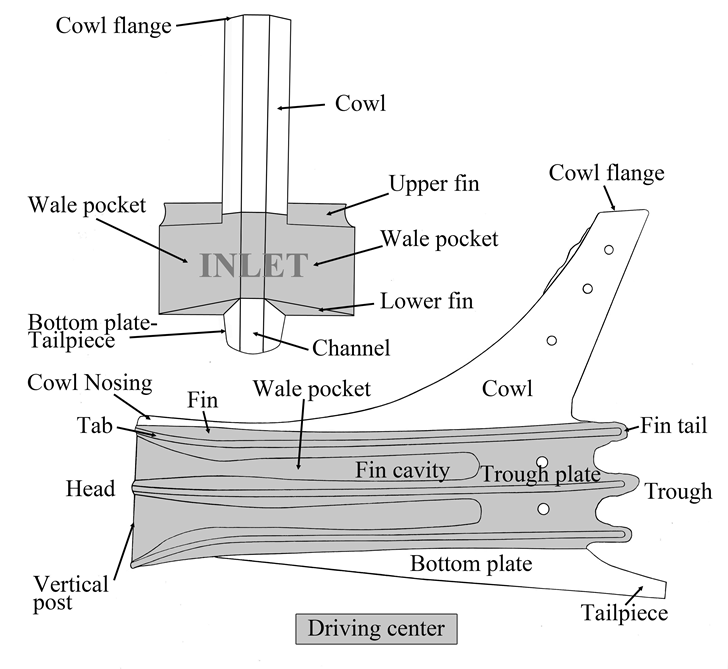 This metal analysis will provide the definitive results on the ram castings. 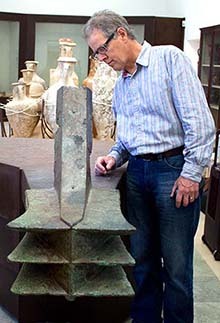 In an effort to examine surface corrosion, X-ray fluorescence was chosen as a non-destructive method to provide rapid elemental composition of two bronze artifacts for analysis in 2011. 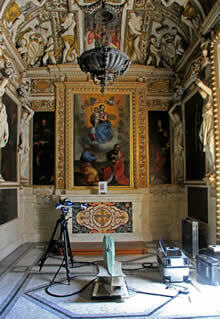 Peter Campbell and a team of researchers analyzed surfaces of a bronze helmet and the Egadi 3 ram. The results suggest that the two artifacts were created using two different casting methods. After being exposed to the same site formation processes, corrosion products should be similar; however, only 60% of the elements present are shared by both and in vastly different concentrations. Another important result was that the interior of the Egadi 3 ram was exposed to corrosion for a shorter time than the exterior, due to the interior of ram being filled with the wood when the warship sank. A number of trace elements are present, but four in particular are of interest; P, Bi, S, and Fe. P is found in both the ram and helmet in amount around 1% or less. The presence of phosphorus in the Athlit ram was taken to mean it was used as a degassing agent, likely derived from bone powder. Bi is absent from the helmet but is present in ram. As an element that segregates, Bi can indicate a low-quality casting. Bronze is resistant to oxidation in water due to a quick developing patina, first of copper sulfate (CuS) followed by copper carbonate. In the helmet, S is present, but it is absent in the ram. This could indicate that the time between casting and deposition into the sea was small and the ram was rushed into service. The rear port side of the ram has a far higher Fe content than the rest of the artifact. – Peter Campbell.